The Erasmus+ Programme builds on the achievements of more than 25 years of European programmes in the fields of education, training and youth, covering both an intra-European as well as an international cooperation dimension. Programmes of cooperation with industrialised countries in the field of higher education. Education, training, youth and sport can make a major contribution to help tackle socio-economic changes, the key challenges that Europe will be facing until the end of thedecade and to support the implementation of the Europe 2020 strategy for growth, jobs, social equity and inclusion. ACTION 3– Support for policy reform. Actions of the KA1 and KA2 are managed at decentralised level by the National Agencies; actions of the KA3 are managed at central level by The Education, Audiovisual and Culture Executive Agency (EACEA) in Brussels. Due to the improvement of the structure of the new programme and significant increase of its budget the EU will create greater opportunities. The Erasmus + main priorities correspond with main objectives of the LLP Erasmus programme just closed. • effective management of Sport initiatives aimed at combating match-fixing, doping, violence and racism, intolerance, especially in the most popular sport disciplines. In practice, the Erasmus+ programme provides great foreign mobility opportunities – to acquire new educational skills (e.g. studies, work, trainings and volunteering) for students, teaching and youth staff. What is more, it supports the establishment of partnerships between universities, higher education institutions, high schools, companies and non-profit organizations aimed at improvement of innovativeness and knowledge creation. The seven year programme will have a budget of €14.7 billion; a 40% increase compared to current spending levels, reflecting the EU's commitment to investing in these areas. The Erasmus+ will provide opportunities for over 4 million Europeans - students and adults - to study, train, gain work experience and volunteer abroad. Other countries – participation depending on the action and area (sector). The Erasmus+ programme in Poland is managed by: the Ministry of National Education, the Ministry of Education and Higher Education, and the Ministry of Sport and Tourism. During the Erasmus+ programme implementation the European Commission cooperates with The Education, Audiovisual and Culture Executive Agency (EACEA) in Brussels and National Agencies in different countries. In Poland the Erasmus+ programme National Agency is Foundation for the Development of the Education System in Warsaw. 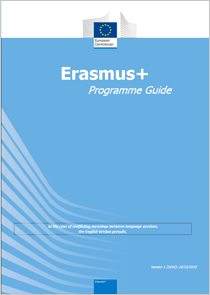 More detailed information is available on the official Erasmus+ website. While the information centre and source of multimedia documentation about the Erasmus+ programme including publications, presentations and videos is Mediateka.